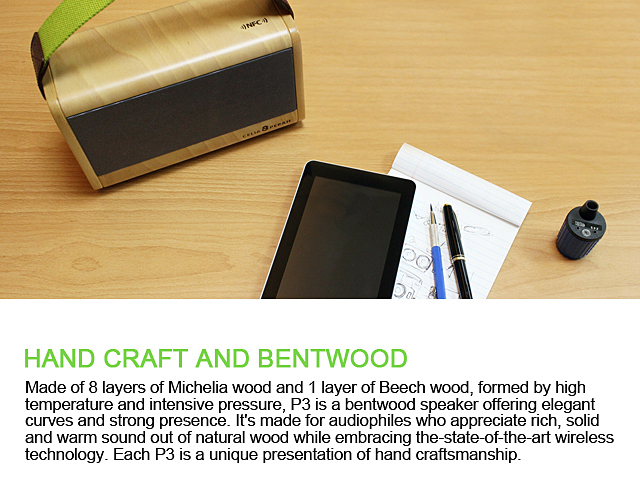 Made of 8 layers of Michelia wood and 1 layer of Beech wood, formed by high temperature and intensive pressure, P3 is a bentwood speaker offering elegant curves and strong presence. 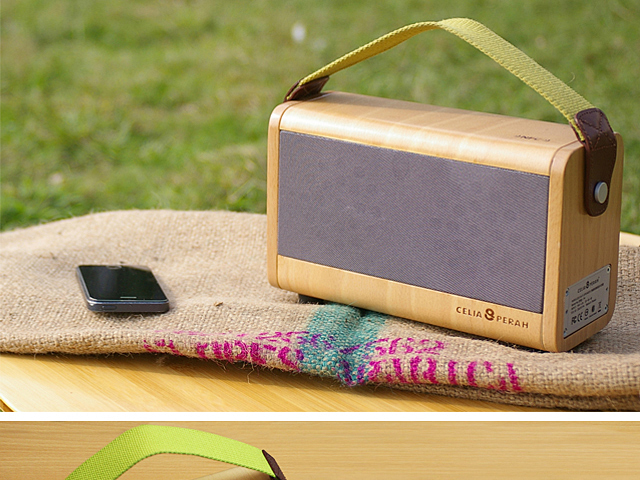 It's made for audiophiles who appreciate rich, solid and warm sound out of natural wood while embracing the-state-of-the-art wireless technology. Each P3 is a unique presentation of hand craftsmanship. P3's unique design creates maximum acoustic volume with very limited internal space. 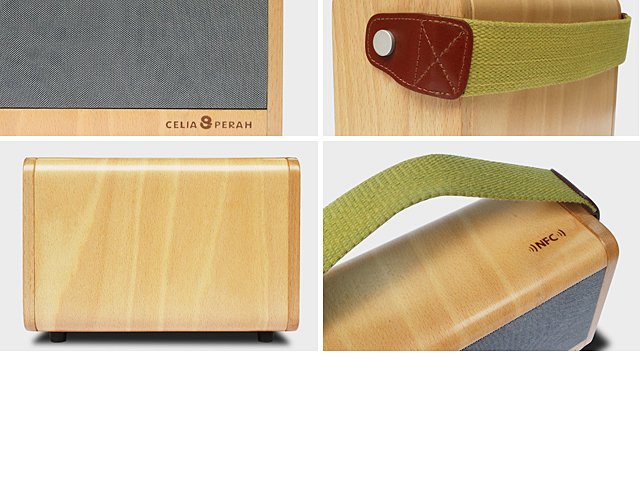 Thanks to CELIA & PERAH's professional tuning technology, this compact speaker has much to offer than just solid bass and powerful sound. 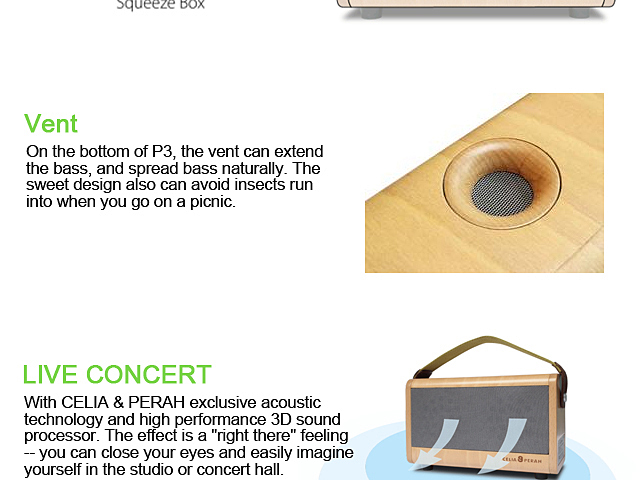 On the bottom of P3, the vent can extend the bass, and spread bass naturally. The sweet design also can avoid insects run into when you go on a picnic. 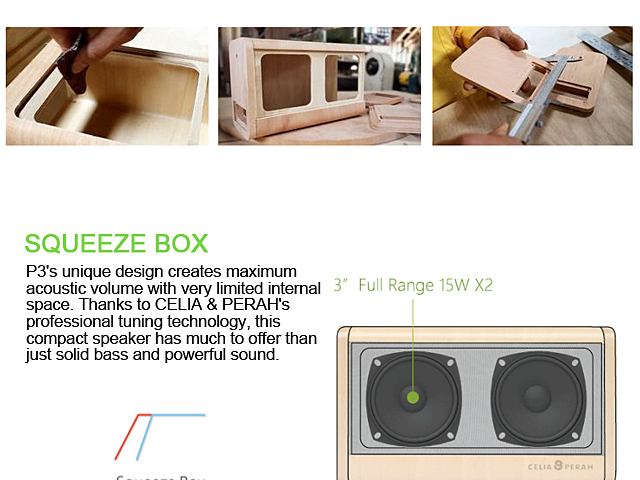 With CELIA & PERAH exclusive acoustic technology and high performance 3D sound processor. The effect is a "right there" feeling-- you can close your eyes and easily imagine yourself in the studio or concert hall. 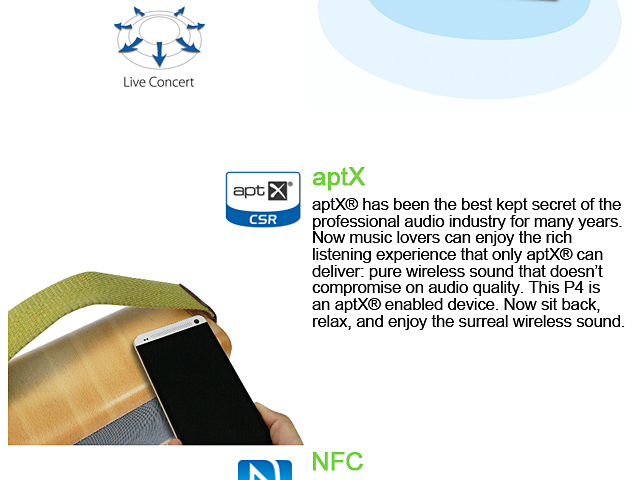 aptX has been the best kept secret of the professional audio industry for many years. Now music lovers can enjoy the rich listening experience that only aptX can deliver: pure wireless sound that doesn't compromise on audio quality. This P3 is an aptX enabled device. Now sit back, relax, and enjoy the surreal wireless sound. NFC is Near Field Communication. Put the Bluetooth device (supported NFC) near the NFC logo on the top of P3, it will make Bluetooth connection automatic. Extremely simple setup complete the steps of enabling, enjoy the music immediately. 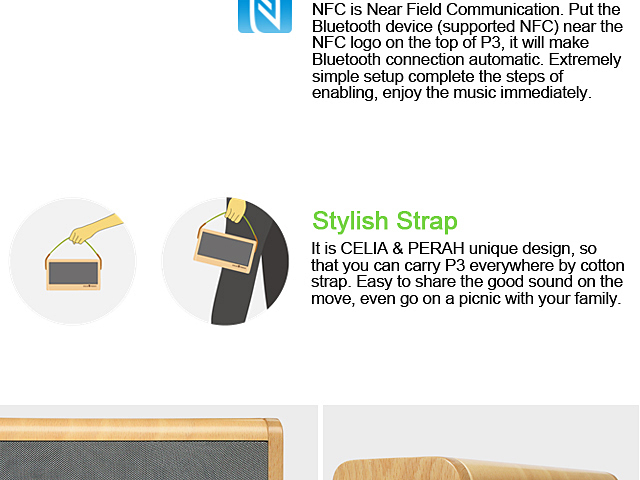 It is CELIA & PERAH unique design, so that you can carry P3 everywhere by cotton strap. 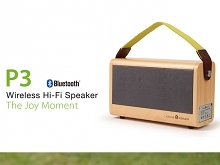 Easy to share the good sound on the move, even go on a picnic with your family.